Hidden inside Laguna Park (Blk 5000F Marine Parade Rd #01-22/23), is this Hainanese restaurant, also serving beef noodles only at lunchtime. Their renowned noodle is very good. It comes with a sharp chilly sauce and side soup. The beef is quite tender and the gravy mild and balanced, but tasty. Ideal for a light lunch. The "shredded chicken with sesame" looked rather different from what I expected. It wasn't shredded (it came in cubes) and it wasn't particularly sesamy. The chicken pieces were dry although the gravy was quite nice. An OK dish, but nothing spectacular. 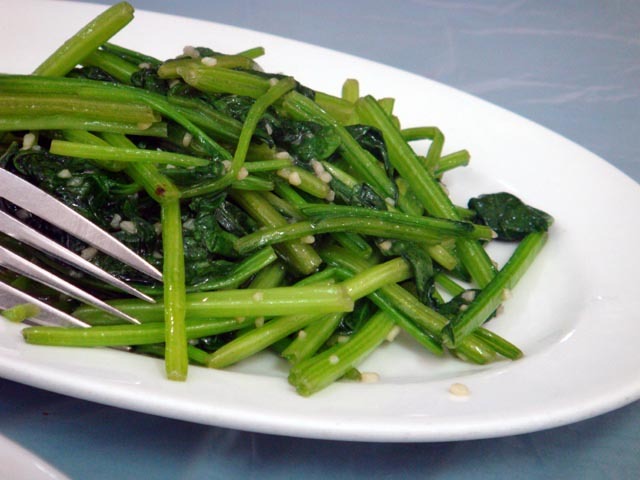 The stir fried spinach was overcooked and too loaded with garlic and even then not all that tasty. A bit of a disappointment overall. In summary if you happen to be in the area at lunchtime this place is worth a visit to try their noodles, but I wasn't particularly impressed by the rest of the dishes I tried. Yet Con is an old school restaurant located in Purvis street. The deco is as old style as the service, which is what you would expect at a place of this sort. None of the dishes I had was a disappointment and prices are reasonable, apart from the vegetables ($10 per plate). Both chicken rice and beef hor fun come recommended. 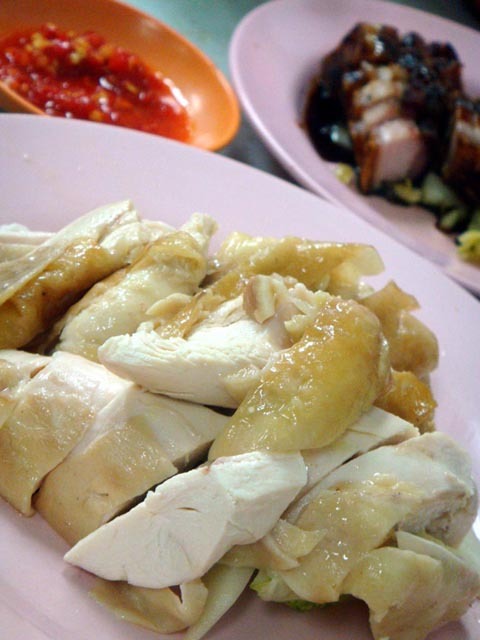 The steamed chicken is nice and chunky, lean and juicy. I particularly like the distinct flavour of their chilly sauce, which can be mixed with ginger served on the side. The roast pork is rather interesting. It's served in a slightly sweet sauce on a bed of pickles. 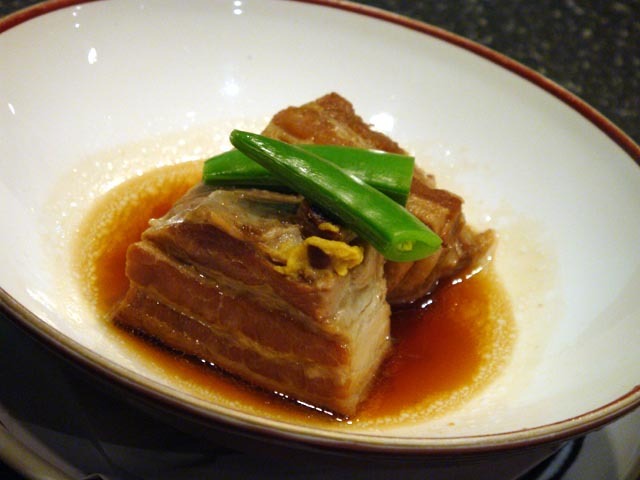 The pork is very crispy and dried to the right point, and it combines well with the crunchy pickles and rice. However, some might find the sweet sauce unusual, so if you prefer it dry and simple let the waiter know. The beef hor fun are probably the best I had so far. I found them better than the stall in Geylang. More "care" is put into them, more attention to detail. The vegetables, the mild sauce and the beef combine into a gentler taste while maintaining that original "rough" food stall feeling. 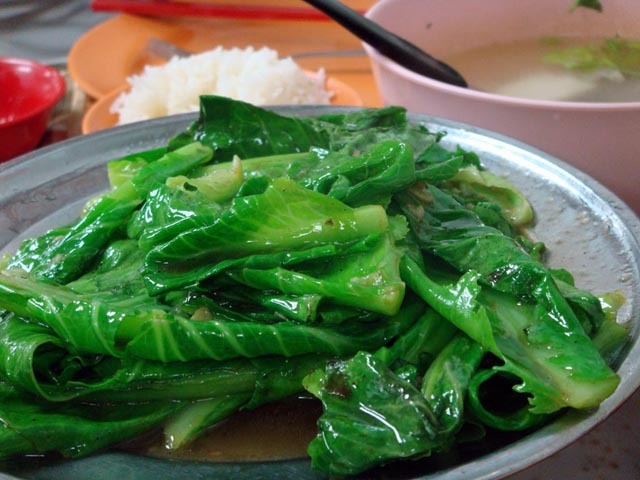 The kailan are quite expensive when compared to the rest of the food. They are nothing remarkable, but fresh and juicy. Overall, Yet Con is worth it. 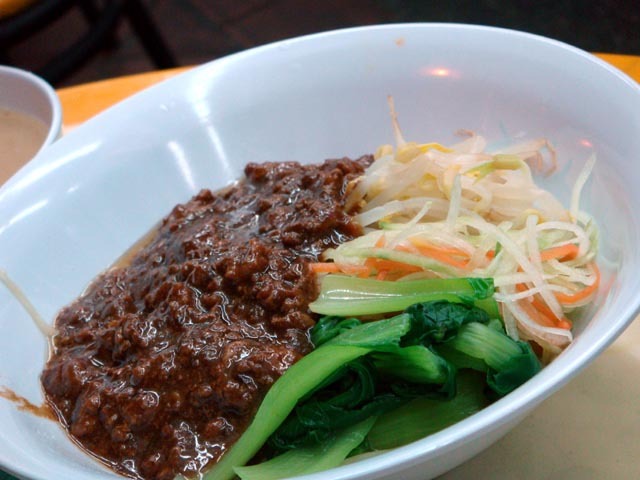 If you like Purvis Street with its "old Singapore" colonial feeling, Yet Con will deliver food to match. I have been eating regularly at Wahiro for the past two years. This restaurant is well hidden inside Katong Mall, and it's one of those restaurants that don't particularly attract you from their exterior, but won't leave you disappointed once you walk in and appreciate the cozy atmosphere and the quality of the food. 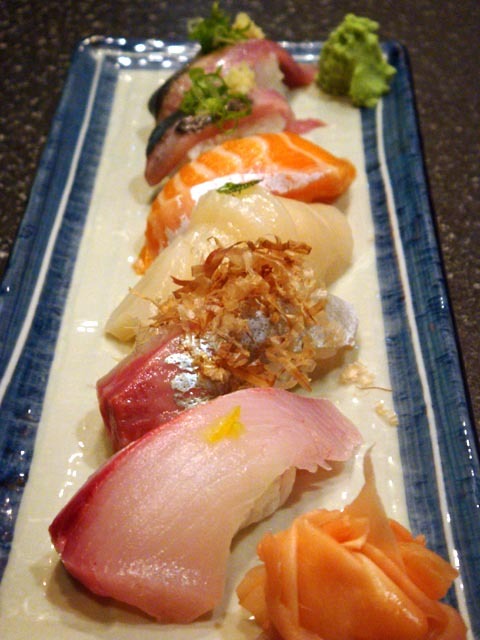 Sushi is highly recommended at Wahiro. I find that the quality of their sushi is consistent and really good value for money. It is in fact at the same level of other very expensive establishments, without hurting your wallet as much. The fish selection is usually quite limited, but what they have is not only fresh, it's also well selected. It's always worth having a chat with the Sushi Chef to find out what's the fish of the day and what he recommends. Sometimes they have new delicacies that you might not have had the opportunity to try elsewhere. I do not recommend having the sushi moriawase. It won't give you a good indication of the quality of the sushi, as they won't be made in the same way as the a-la-carte sushi. The fish slice is smaller, and the cut from a cheaper part. If you want the best, order a-la-carte, and if you would like to try something new, you could also ask for the special: tiny tasty decorations placed on each sushi slice. Yuzu skin (Japanese lime), katzuobushi (dried fish flakes), Sakura (cherry blossom) or other decorations can add interesting tones to the firm texture of your sushi. I ordered a whole "sanma" from the sushi counter. As in the best Japanese tradition, no part of your fish or seafood is thrown away. 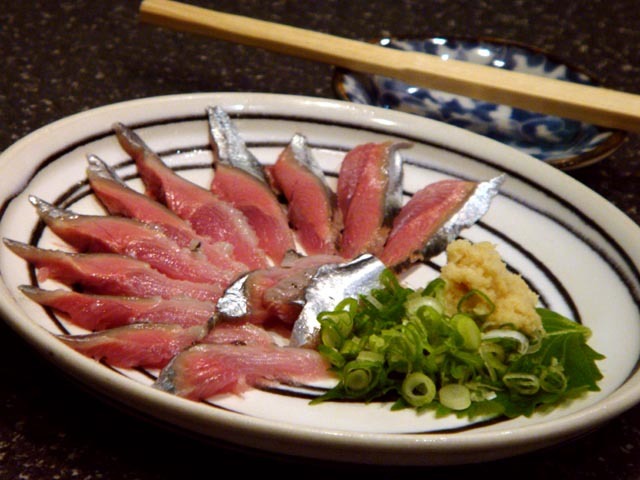 Some of it was served as sashimi (with fresh ginger and spring onion), some of it as sushi, while the rest was grilled. The spine was served deep fried. The same applies to the scallop that was served with my sushi. the "spare parts" of the scallop that were pulled out of the shell, were nicely served in punzu sauce. Buta Kakuni was pretty good, although I usually prefer it when some Daikon served is with it. The meat was tasty, tender and juicy. Kushiyaki is quite good at Wahiro. 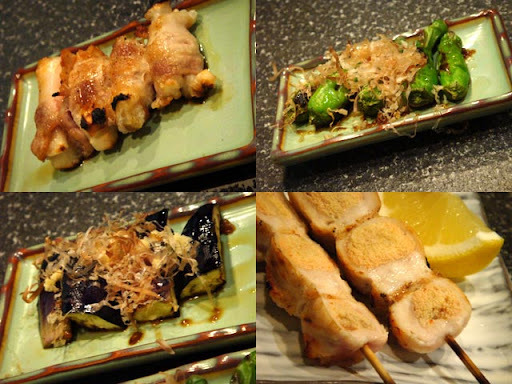 Besides the standard types of kushiyaki, they have a couple of interesting combinations. My favourite is "mochi buta bara maki" (pork belly rolled around rice cake / top-left). I love the crispiness of the bacon and the cheesy chewish texture of the rice cake within it. I also like "tori ume" (chicken with plum sauce) and "tori mentaiko" (chicken with cod roe / bottom-right). 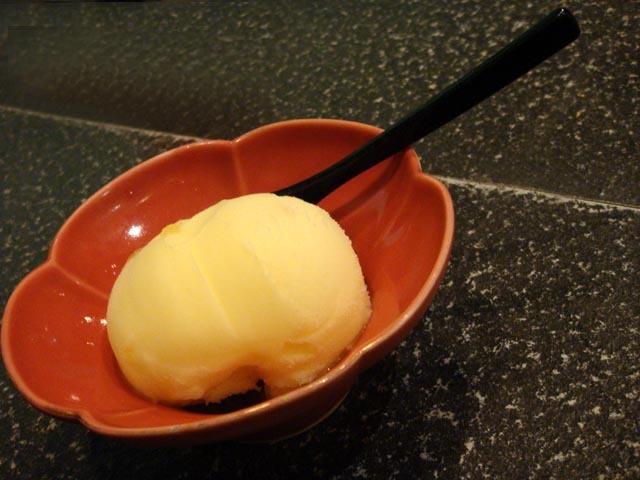 Finally, a Yuzu sorbet will help clear-up your mouth with it's tangy flavour. It's rich in bits and pulp of real Yuzu! Wahiro is one of those restaurants that perhaps don't offer the trendiest atmosphere, but focus more on authenticity and quality of food. They also have a menu tasting "Wahiro" course that looks interesting, although I have only tried 3 of the dishes that come with it. The set lunch is a real bargain. For only $15 dollars you are served a full 4 course lunch including soup, sushi, appetiser, side dish and fruit. Although all the above is recommended, I have not had a bad dish at Wahiro, and was never disappointed. UPDATE: This stall in Katong IS NOW CLOSED. It has moved to Centerpoint, B2 food court. I have been regularly patronising this stall for the past couple of months. Discovered by chance by stumbling into an advert placed around the corner from it, in the heart of Katong. The food stall called "Dragon's Delights" and it is located inside the well known "Mary's Corner" establishment (at the junction between Joo Chiat Road and East Coast Road), completely out of sight. 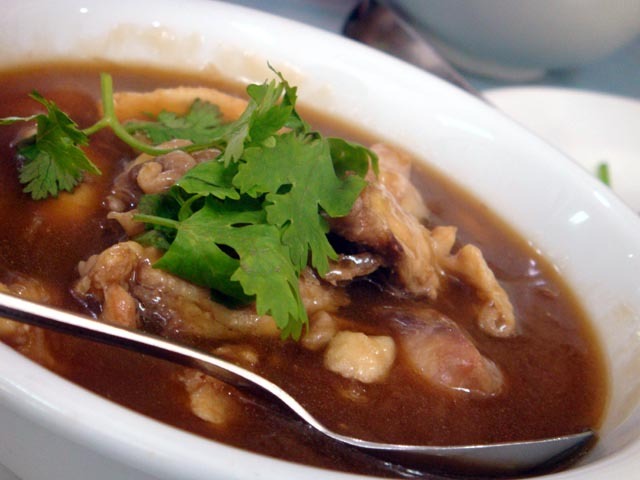 Nevertheless, this is a culinary gem not to be missed for those who love Beijing-style cooking. Needless to say, the noodles and dumplings are handmade on order, as the rest of the food. 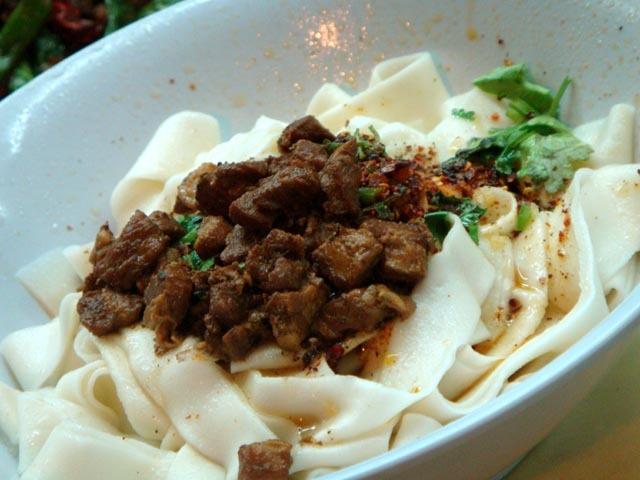 Noodles are the must try, whether you go for the beef or pork brisket lamian, the Zhajiang mien or flat noodles with pork (pictured - $5.50). 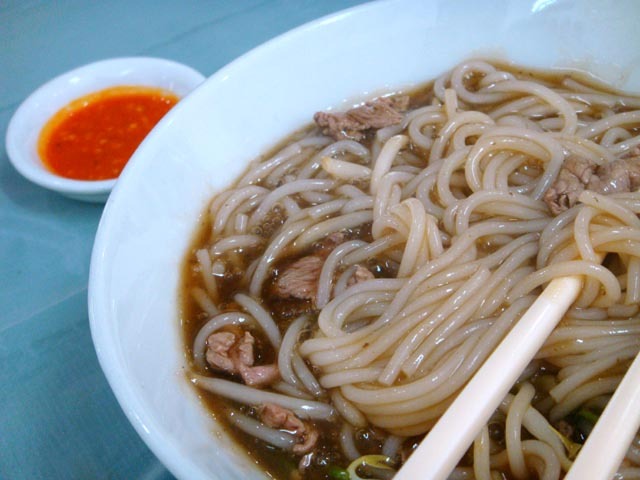 With Zhajiang noodles (pictured) being my favourite, I have tried these in different places including cheaper and more expensive restaurants, but none of them gets as close to the authentic taste as these do. There is no doubt that $3.50 for such a delicacy is a real bargain. 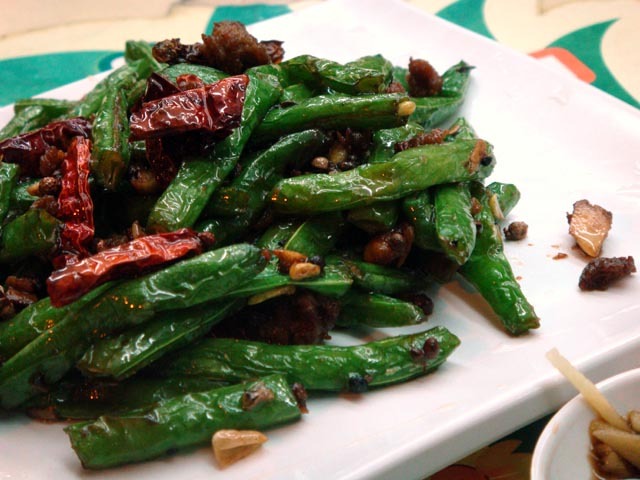 If you are one of those who feel guilty stuffing yourself with carbo without having some greens, you must try the fried french beans with pork. 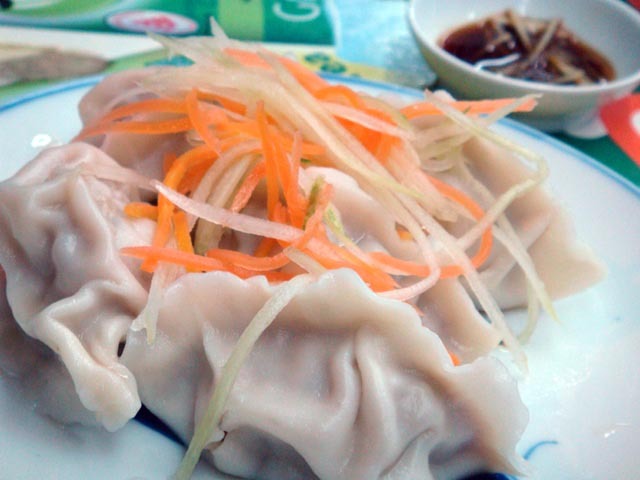 This is one of those classics that you can find in most Chinese restaurants, in various different styles. I love the beijing style, with that distinctive "rough" flavour rather than the usual sweetened one. 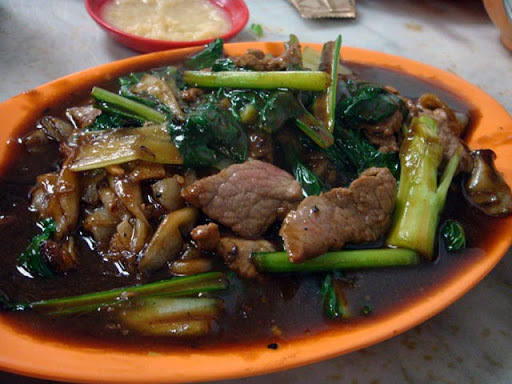 It's clear, enriched by the sharp spiciness of the Schezuan peppercorns and savoury lean pork. 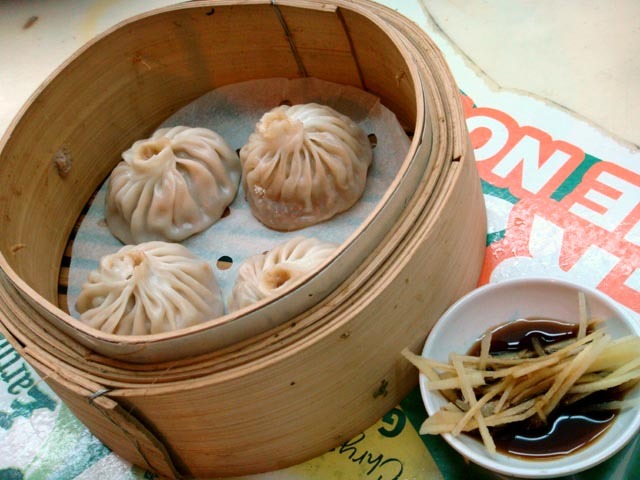 The soup dumplings are also well executed, although they are not what you will be going to this stall for. This is far from being a rarity in Singapore, so my recommendation is the Northern China boiled dumplings. They have a very fragrant "Northern China" flavour, the result of a combination of spices, and that characteristic firm texture. Overall, this is a place that any lover of Chinese food must try. It's culinary heaven for everyone's pockets.